Illinois Gov. Pat Quinn on Tuesday used his amendatory veto powers to send the concealed-carry legislation back to the General Assembly. He called for a reversal of a measure that prevents local municipalities like Evanston from passing their own gun laws. Illinois Gov. Pat Quinn used his amendatory veto powers to send a concealed-carry bill back to state lawmakers on Tuesday, signaling an uncertain future for Evanston’s proposed ban on assault weapons. 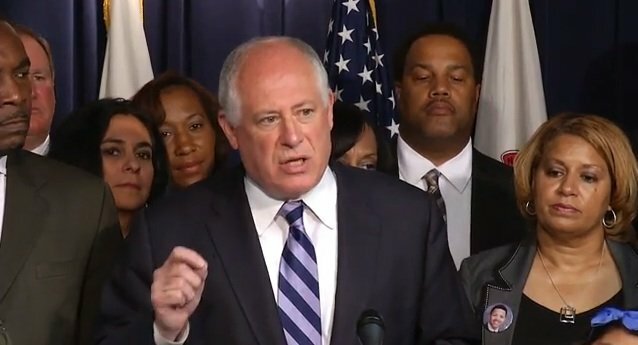 Among the more significant changes Quinn called for was a reversal of a measure preventing local municipalities like Evanston from crafting their own gun laws. The legislation, which would allow permit holders to carry firearms in public, was sent to Quinn’s desk at the end of May. At the time, Evanston aldermen scrambled to take advantage of a loophole in the ball that outlaws home rule on gun control with the exception of one area: assault weapons. Local ordinances regarding assault weapons, however, had to be passed no later than 10 days after the concealed-carry law went into effect. An ordinance to ban assault weapons in Evanston was introduced to the City Council just two weeks after aldermen asked the city’s law department to draft it. The proposal stirred heated debate and even the threat of a lawsuit. Mayor Elizabeth Tisdahl has said council will avoid passing ordinances that could lead to expensive litigation. Blair Garber, a member of the Illinois State Rifle Association, voiced his opposition to the ban at last week’s council meeting. The Evanston resident said Monday he would gladly serve as a plaintiff should the National Rifle Association or SRA file a lawsuit against the city. “It’s not going to stop one murder in Evanston because there’s never been a murder in Evanston using an assault rifle,” Garber told The Daily. Assault rifles have not been used in a shooting in recent memory, Evanston Police Cmdr. Jay Parrott said. However, several assault rifles have been confiscated by EPD during investigations. Whether or not the assault weapons ban is passed, it marks a dramatic shift for Evanston over the past five years. Evanston has steered clear of legislative solutions to gun violence since 2008, when a Supreme Court ruling and subsequent NRA lawsuit led the city to amend its 27-year-old handgun ban, which was one of the strictest gun laws in the nation at the time. After three young Evanston residents were fatally shot in 2012, community leaders looked to hands-on measures to curb the gun violence, including a firearm buyback program and EPD’s expanded Text-a-Tip program, which rewards anonymous tips on illegal guns. A spring wave of gun activity and the fatal shooting of an Evanston man in Chicago sent the city reeling again, and gun violence was back on the agenda. “I don’t know that City Council will pursue a legislative solution, but I think the Evanston community could pursue a legislative solution and could ask our representatives to raise the issue again,” Tisdahl told The Daily in May. Evanston’s proposed ordinance, however, may be rendered irrelevant if state legislators accept the recommendations that Quinn offered Tuesday. That looks unlikely, though, as leaders in both the state House and Senate have said they want to override Quinn’s amendatory vetoes. Summer reporter Ciara McCarthy can be reached at ciaramccarthy2015@u.northwestern.edu. Follow her on Twitter at http://www.twitter.com/mccarthy_ciara.